I have written here before about the cultural stew created when you combine years of professional dance training, ukelele and a seriously off the wall sense of humour. Wel the latest video from Face Trumpet is their strangest yet, a tribute to the head-nodding genius of Bobby Crush. Honestly. There is a rumour of some live dates in the new year. The mind boggles. It begins with two girls, Anna and Claire, raised as sisters whose bond is broken apart when Anna develops a passion for the hired man Coop. When they are discovered by her father he unleashes an act of violence which shatters this family apart. Anna defends her lover by plunging a shard of glass into her father's shoulder and this shard will return as a symbol later. 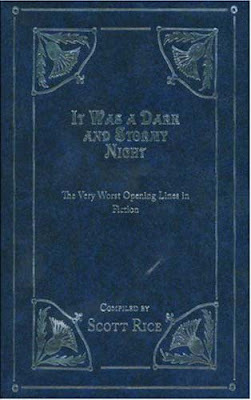 As Anna is spirited away into the stormy night by her father Coop is left for dead. We then pick up the various pieces, following Coop's career as a gambler which will end in another vicious beating and a second saving by Claire. 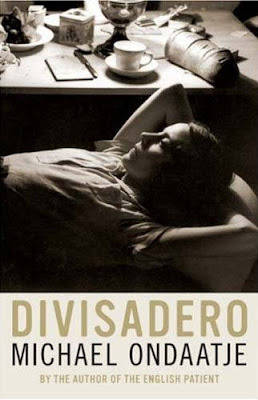 Anna meanwhile becomes a writer and her researching of the life of a mysterious French writer Lucien Segura form the scond part of this novel. This structure is frustrating because there is an epic power to the writing of the first half, something of the Greek tragedy about the setup of one man being father to three children who have all lost their mothers. After the violent climax of this section we are left with relativley mundane fallout; the business of Coops training as a cardsharp only livening slightly when we get to his big score and the complications of Claire's relationship with him made clear when he mistakes her for Anna when she finds him battered and destroyed a second time. When we are reading Anna's writings of Segura it is difficult at first to see the connections between the stories but that glass shard returns, this time partially blinding Segura, and removed from his eye by Marie-Neige a woman with a violent husband who forms a close bond with the young Segura when she reads to him during his convalescence. Many images and motifs return slightly altered from the earlier story and just as Coop calls Claire by the wrong name, so Segura will be mistaken by Marie-Neige for her absent husband later on. People often write about Ondaatje's poetical economy with language. Unfortunately there are times, particularly when we are following Coop in Tahoe that this economy manifests itself in short sentences with an almost adolescent repetitive syntax. However there are other moments when the little he writes on the page creates much more in our minds. Here for example is his description of the coupling of Marie-Neige and her powerful husband. After that she turned and put her arms out along the thick rim of the barrel where in the water was the moon and the ghost of her face. Roman moved aganst her, and in the next while, whatever surprise there was, whatever pain, there was also the frantic moon in front of her shifting and breaking into pieces on the water. Its like a villanelle, this inclination of going back to events in our past, the way the villanelle's form refuses to move forward in linear development, circling instead at those famliar moments of emotion. Only the rereading counts, Nabakov said...For we live with those retrievals from childhood that coalesce and echo throughout our lives, the way shattered pieces of glass in a kaleidoscope reappear in new forms and are songlike in their refrains and rhymes, making up a single monologue. We live permanently in the recurrence of our own stories, whatever story we tell. For those who have read his other novels there will either be lots to admire or a worrying continuation of the alienating structure of his recent work. For those who haven't read him before The English Patient is a much more satisfying place to start. At last, a chance to take a peek at the new Batman film. Enjoy. This was the year I started to read (and write) blogs, one of which was Me and My Big Mouth. Scott Pack was kind enough to send me a copy of this slim novel and what a gem it turned out to be. The deceptively simple plot revolves around three West-Indian men working in a public toilet, but this is a novel which contains so much: Racial and sexual prejudice, relationships between and amongst the sexes and some of the most sharply observed dialogue I have ever read. So sharp in fact that when two actors approached Collins about turning this into a film they were surprised to find that he himself wasn't West-Indian. I have felt at times that I was the only person in the UK who had read Johnson but I have since discovered a few who share my passion and this year saw the publication of his first novel in seven years. And what a novel. A vast Vietam war era epic with a huge cast of characters, huge themes and the National Book Award as reward for his efforts. It has its flaws but the ambition and scope are enough to put it right at the front of my mind when thinking back on this year. Hopefully it may introduce him to a wider readership. Not-book-of-the-year: On Chesil Beach by Ian McEwan. Sorry everyone, I don't get the fuss. Not only was this Radiohead's best music in years but the method of its release managed to cause a huge stir throughout the music industry. That has always been the potential power of this band and it was gratifying to see them wield it and get away with it. 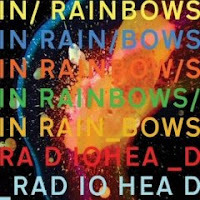 As for the album itslef Thom Yorke has said that they called it In Rainbows 'Because it was the desire to get somewhere that you're not'. After the protest of Hail To The Thief this was the sound of a far more positive band and a more personal approach lyrically from new Dad Thom. 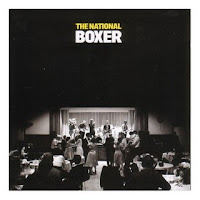 The National are one of those bands whose adherents speak passionately about their music. 2005's Alligator was a real highlight that year and whilst Boxer felt similar at first it has revealed its subtleties over time. Matt Beringer's distinctive vocals lend the dramatic playing real gravitas. I saw them live at this years Latitude Festival and I'm sure they won some new fans that day. Not-album-of-the-year: Myths Of The Near Future by The Klaxons. The Mercury jury triumph again. I knew I hadn't been to the cinema much this year when it turned out that the two films I picked (Casino Royale- making Bond brilliant again and Apocalypto- a stunning, visceral experience) were actually released in 2006. Ooops. Don't worry about whether this film is the revolution in film musicals some have called it just revel in its unabashed romanticism. It's rough around the edges and all the better for it and charts brilliantly and painfully what it feels like to fall in love. Honourable mentions: The Lives of Others, Little Miss Sunshine. As I have written here this was the year I did The Sopranos. All of it. In one go. Wow. One of the most enjoyable experiences in my life. Where on earth do I go from here? I have found this year that the stuff on telly that's making me tune in is comedy. Another series of Curb Your Enthusiasm in the States showed Larry David having more fun than ever, Flight of The Conchords was a real surprise hit making me giggle like a child, The Mighty Boosh returned with their best series yet and Gavin and Stacey showed that British Comedy wasn't the oxymoron it used to be. The Family night-in returns better than ever. Doctor Who continued to re-capture the hearts of the nation and even showed some of the more subversive images on TV. Best of all however is Strictly Come Dancing. Now I'm not a huge fan of reality TV especially not the celebrity variety but Strictly combines charm, the learning of a real skill and the raising of money for charity into one gorgeous bundle. There is always something to talk about from Bruce's declining presenting skills and Tess's wardrobe to dubious scores and the voting of the great British public. Sometimes the dancing even gets a mention. Reading this blog about it all has made it even more entertaining. Not-TV-of-the-year: X-factor. Just rubbish, in every way imaginable. Have you no self-respect? Didn't do much art this year either but there was one piece you couldn't fail to see if you walked around London towards the end of the year. Anthony Gormley's sculptures watched over us all from various vantage points around the city and it was fascinating to spot new ones every now and then. The sensation was uncanny, almost like catching a possible suicide in progress or some kind of alien landing. Brilliant public art, I was sad to see them go. 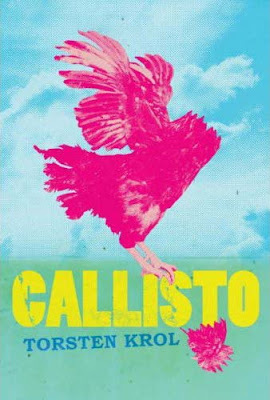 Not much is known about the author of Callisto. With no public appearances and communication with his agent strictly via email there has even been speculation that he may be a more established author writing under a pseudonym. His first novel The Dolphin People was published last year without making too huge a splash, perhaps Atlantic were hoping to draw more attention with this hideous front cover. In this satirical novel we meet Odell Deefus a simple man from America's Bible Belt on his way to enlist for the army. Fate however has other plans for him and when his car breaks down in Callisto, Kansas he begins a journey that will involve murder, drug running, fundamentalist religion and just about every Government agency going. I don't want to say much more about the plot so you can enjoy the roller coaster ride for yourself. The real strength of this novel is in the character of its narrator. Deefus is not so much idiot savant as idiot and his narration is peppered with malapropisms and misunderstandings. The broad brush strokes are reminiscent of DBC Pierre's Vernon God Little (what is it with Australians satirising America?) and for many this may be covering similar ground. Where Pierre focused on the media, Krol looks at American attitudes post 9/11 and this is a book which includes Islam, bomb plots, torture and Condeleeza Rice (as the rather hilarious object of Deefus' affections at one point). At 437 pages it is a tad long and whilst Deefus is an entertaining narrator the naiveté can be a little frustrating at times. America has got pretty good at satirising itself these days so this book isn't as sharp as it thinks nor quite the 'novel of our times' Atlantic might hope it is. But there is a lot of fun to be had along the way and in Odell Deefus we have a guide of such innocence that as he gets himself into deeper and darker territory it is hard not to feel hugely sympathetic. After the triumph of his video for Bad Cover Version I have only just seen the video below for Don't Let Him Waste Your Time. Having seen him live at this year's Latitude Festival (including a cover version of Eye of The Tiger which will live long in the memory) I can confirm that Jarvis has the best sense of humour in music. Where's the novelty Christmas single Cocker? Peter Ackroyd's bestseller London: The Biography seemed to be part of a fashion a few years ago to write 'The Biography' of any kind of inanimate object ranging from the Bible to the Moon. It was however a fascinating journey through the history of the capital and as a Londoner myself I still get a thrill walking through some of the ancient streets and passages (especially those around the river) thinking of who else has been there before me. So what of this history of the river itself? Following a meandering course this book is divided into short thematic chapters such as 'The Working River' and 'The River of Art'. 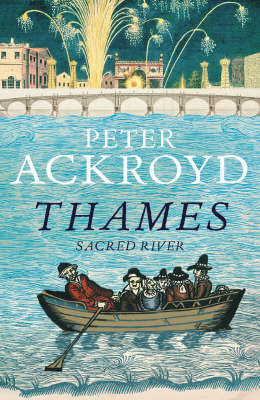 With this approach Ackroyd is able to write not only about the history of the river but what it represents. Some reviewers have complained that this way of writing is not suited to the subject but I found it refreshing and invigorating to read a writer who sees the river in similar terms to the other great rivers of the world. The Ganges is seen as sacred in India and all life in Egypt runs alongside the Nile. In Britain, the Thames has always been associated with power and industry, literally the lifeblood of the capital but its influence is also felt along its full length from Thameshead to the sea. If there is a problem it is that Ackroyd tends to give us all of his copious research and so the myriad of facts in each short chapter, whilst thematically linked, can feel a little disorganised. It is his trademark enthusiasm which keeps the momentum going though and as we follow the river's course it is hard not to get caught up in its wake. I am sure there are better textbooks available for those who want a more serious study but just as his book on London provided a popular, accessible history of the city this companion volume is sure to do the same for its famous river. Gerald began--but was interrupted by a piercing whistle which cost him ten percent of his hearing permanently, as it did everyone else in a ten-mile radius of the eruption, not that it mattered much because for them "permanently" meant the next ten minutes or so until buried by searing lava or suffocated by choking ash--to pee. Brilliant. This book, bound in beautiful mock leatherette, brings together the best of the worst and is a perfect gift for anyone you know who likes reading. Richard Kelly's debut feature Donnie Darko was striking and atmospheric if overly ambitious at times. It was always going to be interesting to see what he did next. Southland Tales looks like another sprawling, multi-layered disaster/triumph; more quirky casting in the form of The Rock and Justin Timberlake, more fantastic music and a plot with more loose ends than an episode of Lost. It was booed at Cannes, it was still being edited up until the last moment and it is preceded by three prequel graphic novels. Blimey. Here's the trailer see what you think.